Understandings, or misunderstandings, of the nature of sin get us into all sorts of tangles. We have become much more wary of talking about sin, because to do so often seems oppressive and burdensome, and yet we can’t really escape the fact that the concept of sin is not far from the heart of our faith. Just a few weeks ago, we heard John the Baptiser defining Jesus as “the lamb of God who takes away the sin of the world.” What are we to make of it? What is sin, and how are we to find the freedom from it that Jesus calls us to receive? The story we have heard tonight from the gospel according to John deals quite directly with these questions, even though at first glance you might be forgiven for thinking it was just a story about the healing of a blind man. As is typical of the way John records the miracle stories, this story is fleshed out with lots of dialogue, and within the dialogue we get a radical interpretation of the otherwise bare details of the story. And to make it clear that the story is being used to shed light on the subject of sin, and how it is experienced and understood, this story begins and ends with questions about sin. Questions about sin begin and end the story, and they do so to ensure that we are alert to what the story is trying to tell us. To unpack it then, we need to shine our light on what happens in the middle. Or better still, allow the light from the middle to shine on us! The significance of the assumption within the disciples’ question is crucial for the way the story plays out. There is a bit of cyclic thinking here which was explicit within the Jewish religious practice of that era, but which is still around in most religious thinking today, including the religious thinking of most Christians. The basic idea here is that sin is the thing which causes us to be cut off from God and from the community of God’s people. Therefore, if we see someone who is cut off or excluded from the community of God’s people, we can conclude that it must be because of their sin. This is hardly any different from saying that if someone is locked in jail, that proves that they are guilty of some terrible crimes. The religious law of that time said that no one with a physical deformity could enter the Temple, so the blind man was excluded. And since being excluded was proof of sin, then the cyclic argument proved that his blindness, which resulted in his exclusion, must itself be evidence of moral failure and culpability. This is pretty much the same as the thought process that goes through my head when I see the homeless man who lives under a bridge near my home, and I see the bong next to his blanket and conclude that it is his sin, his moral failure, which causes him to be homeless, excluded from the community of the upright. But Jesus says I’m wrong when I think like that, and he flatly rejects the idea that sin is to blame for the man’s blindness. Instead, this blindness is an opportunity for God’s creative work to continue. Rather than seeing the blindness as something that has gone wrong, Jesus sees it as a sign that something good – namely the creation of a whole human being – hasn’t been completed yet. So Jesus completes this creative work and the man is whole and able to be included fully into the community. But this story, like the Jesus story as a whole, doesn’t stop with dismissing a primitive view of sin. It goes on to outline a new understanding of sin. And it does this by exploring what happens when the man is ready to be fully included into the community. What happens, of course, is that he is not included into the community. In fact, he ends up being expelled from the synagogue. The reason he isn’t included is because to include him would require a dangerous rethink. We didn’t think we had previously excluded him just because he was blind, but because he was a moral danger, because he deserved to be excluded. And so if we let him in, despite his sin, we’ll no longer know who we are or where we stand. Our nice clear boundaries will become blurry. You’ve heard the arguments. If we let in people who drink, or we let in divorcees, or we let in people who don’t hold our view of the Bible, or we let in homosexuals, where will it end? We’ll be on the slippery slope and soon there will be no clear understanding of sin at all and we won’t know where we stand. The focus of this fear, though, falls not on the man himself, but on the one who is threatening to blur the boundaries – Jesus. In fact the Pharisees, the guardians of the legal boundaries, offer the man some acceptance if he will cooperate with them in proving Jesus to be a sinner. After all, what ever this man is supposed to have done is not nearly as dangerous as Jesus coming along and suggesting that with a bit of spit and mud and a wash in the pool, all those who we have always known were deservedly outsiders might be suddenly be seen as insiders, sitting right alongside us. He hasn’t demanded repentance. He hasn’t required sacrifices of atonement for sin. He has apparently dismissed sin right from the equation. Such an outrage must be stopped before the world descends into lawlessness. Can’t you see that this so-called prophet is evil and dangerous? But when the man will not cooperate with their attempt to reseal the borders by demonising Jesus, they turn on him and vilify him and cast him out once more. Many of you have lived that story; many of you in very painful ways. Having been abused and mistreated at the hands of socially-respected people, when your abuse was brought to light, you were shunned because it was much harder to re-evaluate all our assumptions about who were the good guys and who were the bad guys than it was to push you out and stick our heads in the sand. The story of the expulsion of this formerly blind man from the synagogue is, of course, both a foreshadowing of the way they will eventually lynch Jesus, and a step in the process of their eventual lynching of Jesus. And so the interpretation that Jesus puts on their lynching of this man is all the more important, for it is also his interpretation of what has happened to many of you. Now all the judgement in this story seems to have been done by the Pharisees who have been quick to judge Jesus and the formerly blind man, but Jesus says that what he is on about is the judgement of the world. 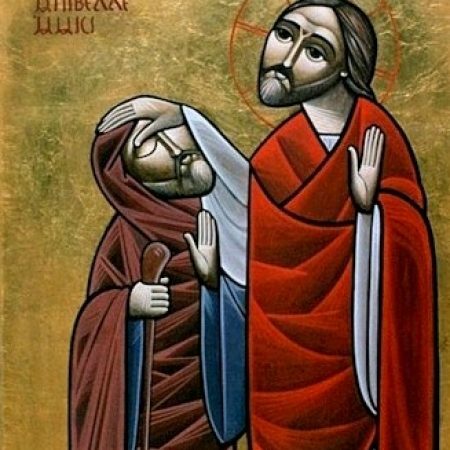 In John’s gospel this is a very clear theme: the judgement takes place in the ways we respond to Jesus as he carries out the creative and healing and forgiving work of the Father in the power of the Spirit. Any time Jesus rubs out an old boundary and we react by fearfully or angrily drawing a new one, we will have passed judgement on ourselves as being on the other side of it from Jesus. The more sure we are that we see who is in and who is out, the more sure it is that we are blind, says Jesus. And so when the Pharisees ask whether he is accusing them of being blind, he says that there is no sin in being unable to see – God can easily forgive and heal our innocent blindness – but since they are so sure that they see properly, their sin is thereby brought out into the light for all to see. The original assumption has been turned on its head. Being excluded is no longer evidence of being a sinner. On the contrary, being victimised and excluded now puts you shoulder to shoulder with God’s chosen one, the lamb of God who takes away the sin of the world. What now becomes the evidence of being a sinner is being one who participates in the excluding. All of us have been caught up in this at some point, because we live our lives surrounded by communities that exclude and victimise, and until our eyes are opened, we are inevitably participants. Almost white Australians once believed that Aboriginal Australians were racially and morally inferior, and should therefore be excluded even from the normal understandings of human rights. The only hope for aboriginal children was to remove them from their sinful squalor, raise them white, and selectively breed their aboriginality out of them. But eventually we came to see that the sin lay in the very act of refusing to include them as fully human and as our moral equals. And as always happens when the light is shone on such sin, our first reaction was to defend the rightness of our original position and angrily confirm and compound the exclusion. “If you were blind, you would not have sin. But now that you say, ‘We see,’ your sin remains.” And eventually we truly saw, and admitted our blindness, and apologised for our sin. Our churches made our apology in a Baptist Union Assembly. Our nation did the same a few years later in the parliament. Now we are in the process of doing the same to the children who were abused and ignored in our church-run institutions. No doubt we’ll be apologising to the LGBTI community before long too. But there is one more step, an even more radical step, that Jesus makes here, and which John the gospel writer challenges us to see. We are naturally drawn to identifying with the blind man in this story, and for many of you, there are real and painful reasons why that is easy to do. But if we simply identify with the blind man, we may be just as guilty of redrawing the lines that Jesus was seeking to erase. We may simply reverse the definitions of who’s in and who’s out so that we’re in and those who rejected us are out. This story challenges us to recognise ourselves in the Pharisees too. If we just vilify and victimise them for vilifying and victimising us, there will be no reconciliation and no healing of the world. The tragedy we often witness on a small scale will be writ large and the victims will become the abusers and the world will continue to spiral down into a dark hellhole of hatred and bitterness and terrorising. But the good news is that Jesus can and will and is taking away the sin of the world by absorbing it in his own body and rising from the grave to greet both the victim and the Pharisee with the astonishing word of forgiveness and healing and love. The good news is that even the worst that our victimising and lynching can do cannot kill the love of God and cannot confine Christ to the grave. The good news is that whether you are the broken victim of the judgemental abusers, or the sin-blinded Pharisee, trapped in the darkness of your legalistic box and crippled by your fear of collapsing moral certainty, or whether, like most of us, you are sometimes one and sometime the other and often both, the good news is that Christ is risen and is joyously erasing the lines that would cut you off from the love and mercy of God, and so long as you don’t keep redrawing the lines, the way is open for you to wash in the pool that your eyes might be opened and that you might find your way into the loving embrace of God and the gracious (but often bewildered!) communion of his formerly blind but now freely forgiven people.